Let’s face it, coffee is a social trend. Those who love it, because they just do. They love it. They love the taste of it. They always have! They love to sit around and have conversations with friends while they drink it. They love the photos of coffee on social media, because it makes them feel warm and fuzzy inside. There are even some who love it more, because everyone else likes it too! Why should they go against it? So what if it’s a social trend?! They love it anyway! Those who hate it, because they just do. They really don’t like the taste! And there will always be some who only hate it, because those girls just drink coffee so they can post it on Instagram and it’s the thing to do. Coffee is only popular because it’s a society thing! I like mine black! I liked it before it was social. I will drink it in the closet for all of time, because I hate all the buzz about coffee! 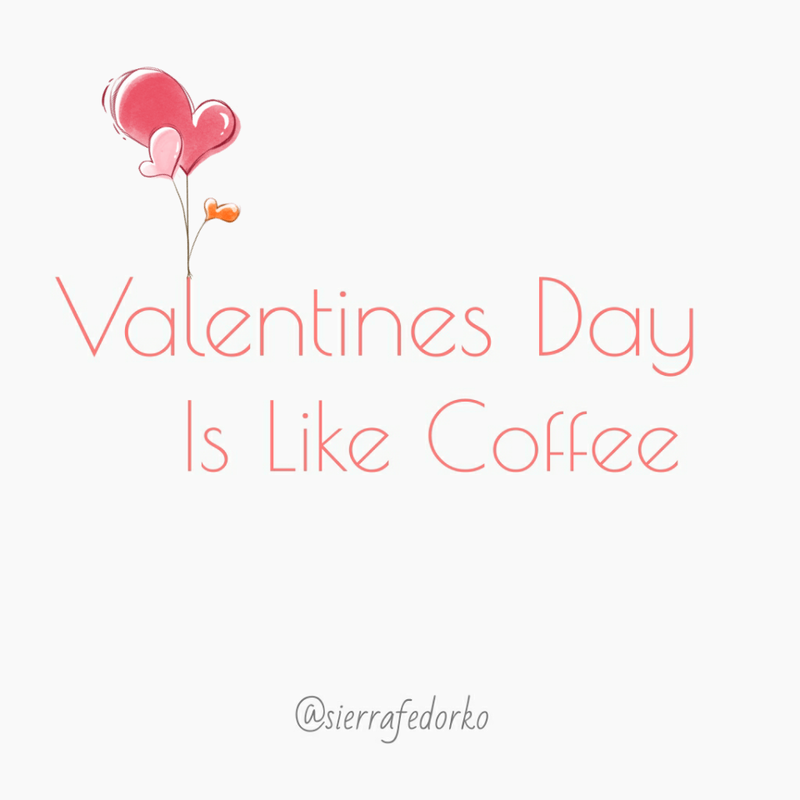 And I’m starting to think that Valentines Day has become a lot like coffee. You either LOVE it, because you embrace the holiday for what it is… or you HATE it because it’s some society thing that you feel like you have to go against. The internet explodes about Valentines Day! They tell you how you should & shouldn’t act, how it’s really about this or that, and if you buy a card…you got sucked in. Flowers, really? Giving flowers is like giving death, because they DIE. Then you have the die-hard You should be telling your spouse/family/friends that you love them every day of the year! Upon this resolution, they decide not to say or do anything that says I love you on Valentines Day, because they will fight this cheesy holiday with everything they’ve got! It’s pretty funny when you think of those people who don’t celebrate love on Valentine’s Day after proclaiming that you should be celebrating love every day of the year (HUH?!). Hey, I get it. You can tell someone you love them every day, and you should! I’m not just talking about significant others or spouses. You’ve got family members and friends, folks. They need to hear I love you as well. Guys, Valentines is just holiday in which you say I love you like you ordinarily would. However, on this day, you have an excuse to eat an entire box of chocolates, even if you buy them for yourself! That’s a pretty good deal! Often we either love or hate Valentines Day, because we’ve made it about ourselves. Will this day benefit me? Will I be treated wonderfully? Why am I not treated better? Why does nobody care about me? If only….? This is totally wrong(and btw, wives & girlfriends think this way sometimes too)! Embrace Valentines Day for what it is! A day of celebration, in which YOU have the opportunity to say I love you to family & friends. YOU have an excuse to make a big deal out of those loved ones in your life. YOU get to buy that friend a box of chocolates or fill a vase with flowers for that lonely girl. Make someone’s day this February 14th! Instead of looking in at who loves you, who could love you more, or who doesn’t love you now…. look OUT to how you can love those in your life. How can you give to others? How can you say I love you in a sincere way? Embrace this holiday….not for yourself, but for others! WOAH, girl! This is awesome! I’ve been totally selfish the past few Valentines. Thanks for challenging my perspective.